It used to be that you studied business in school not because you wanted to change the world and have a meaningful career but to make bank and feel financially secure. But now it appears that majoring in business won't get you job-love or money. 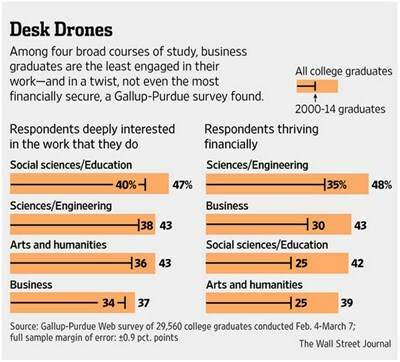 According to a new poll conducted by Purdue University and Gallup Education, people who majored in business are much less engaged with their jobs than those who majored in science and engineering, arts and the humanities, or the social sciences and education. In addition, the poll found that science and engineering majors feel most financially secure. In addition to the above findings, the poll found that, when it comes to engagement at work and financial security, it doesn't pay to go Ivy League but it does pay to go Greek. The poll has revealed that graduates from elite schools fare no better than their state-school peers; that teachers and mentors matter a great deal; that members of fraternities and sororities are generally happier than their non-Greek peers; and that significant student debt can weigh down graduates even decades after they leave school. It also pays to intern. One possible explanation for the general job dissatisfaction among business majors may be linked to the low number who had internships applicable to their studies while in college—a practice that correlates strongly with job satisfaction later in life. One in three science graduates had an internship tied to their major, but just one in four business majors did. And so, in summary, if you think happiness = $, you will, according to the dude that ran the poll, one day be screwed. "My advice to Americans, especially young people, is that if you make a decision about what to major in based on how much money you want to make, you might end up disappointed, not only with your first job but with your overall career," said Brandon Busteed, executive director of Gallup Education. 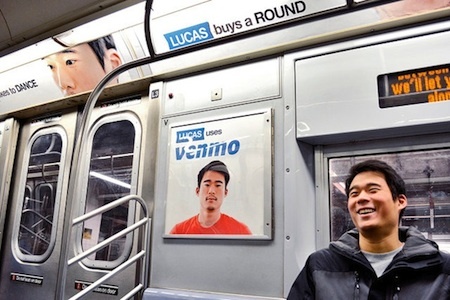 Do Ivy League Grads Have More Fun on Wall Street?